Coherent. That’s the one-word review of Anthony Arnove’s latest book, Iraq: The Logic of Withdrawal (New Press, April 2006). Incoherent. That’s what Washington’s policy in Iraq seems to be. 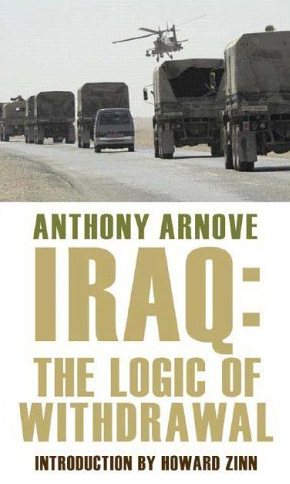 What makes Arnove’s book so important is that he dissects that policy and proves that the war in Iraq is not an incoherent bumble that’s gone awry. In fact, as Arnove makes abundantly clear, it’s US foreign policy as it’s always been. This remains the case even in the light of Condoleeza Rice’s admission of thousands of tactical errors. After all, Ms. Rice didn’t admit that the war itself was an error, only the manner in which it is fought. As the war drags interminably on and people continue to die, the antiwar movement in the US is still fumbling around questions of timetables and demands. One element of the movement has hitched itself to the progressive wing of the Democratic party — a connection that has stifled that element’s ability to make the only reasonable demand an antiwar movement can make: get out of Iraq now and bring the occupying troops home. The rest of us in the movement continue to make this demand but seem to go unheard. Part of the reason for this lies in our allies’ connections to the Democrats in the public mind, but the greater reason is our inability to mobilize the broader mass of the US public — a public that opinion polls tell us is overwhelmingly opposed to the continuation of the war. Like the similarly titled book written in 1966 about the US war in Vietnam by Arnove’s inspiration and collaborator Howard Zinn, Iraq: The Logic of Withdrawal is not a shrill exercise in rhetoric. It isn’t full of make-love-not-war sentiment or calls to hit the barricades with your black bandannas and gas masks. It is exactly what it says it is: a logical, point-by-point argument to the world as to why we need to insist that US troops leave Iraq immediately. There is passion in these pages, but it is the passion of pure logic in the defense of humanity and the earth we live on. Well-researched and well-spoken, the reasonableness of Arnove’s presentation does more than expose the madness of the men and women who are running this war — it uncovers the madness of the system that those men and women work for. It is this element of the book that goes beyond a mere call to end this war. One of the debates within the movement, especially among the liberals and some leftists, is how much of the conversation should be about empire. Arnove argues that because of the economic and geopolitical reasons behind the US invasion and occupation of Iraq, the occupation can only truly end when the antiwar movement understands that it must be an anti-imperialist movement. Like Mark Twain and his circle of anti-imperialist activists back in the late nineteenth and early twentieth centuries, Arnove wants the reader to understand that it is the needs of the financial system we live in that demands that our men and women go off to kill and die. He does this patiently and clearly, without a hint of self-righteousness. Although there is a part of me that sees war as completely lacking in logic and reason, I also understand that the reasons wars are fought are completely logical if one accepts their underlying premise: the system must expand and maintain its empire. On that premise, any resource or place that will help in its task becomes fair game. That is the logic that informs Washington, just like it was the logic that informed all empires before it. As noted above, it is not a logic that has the best interests of the occupied people or the people whose children make up the occupier’s army in mind. The only logical endeavor that benefits those people is immediate withdrawal. Furthermore, it is also why we in the US and Britain have more in common with the Iraqi resistance and its supporters than we do with the politicians and generals running this war. Of course, while this may be apparent to antiwar activists that understand the true reasons and nature of this war, it is not apparent to most people. Partially because of that, even many people who opposed the war before it began are uncertain about the timetable for leaving it. Arnove’s book is an extremely capable and very readable introduction to the argument for immediate and unconditional withdrawal. Not only does he list the reasons that Washington really began this war, he provides a compelling and coherent list of reasons why we should get the hell out. This compact and comprehensive text needs to reach as many people as possible. Buy it and share it. Ask your library to purchase it.